A Hillsborough County sheriff's deputy killed three relatives, including a child, then got on the department's radio to say he'd hurt his family before killing himself near a high school Wednesday morning, authorities said. The incident unfolded before school started in Plant City, a rural community east of Tampa. A Florida sheriff's deputy killed three relatives, including a child, then got on the department's radio to say he'd hurt his family before killing himself near a high school Wednesday morning, authorities said. The incident unfolded before school started in Plant City, a rural community east of Tampa. 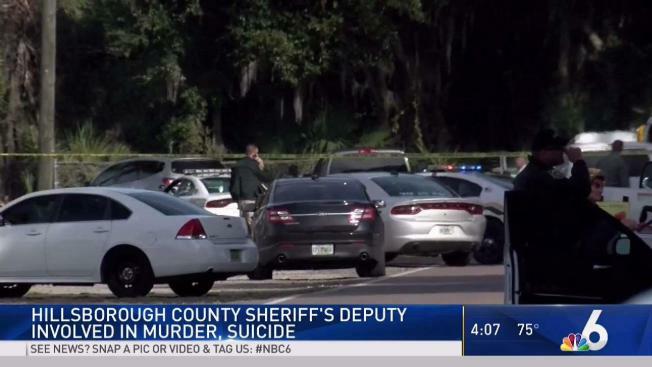 Hillsborough County Sheriff Chad Chronister said a woman and a child were killed at one home, a woman was killed at another home and the deputy shot himself outside Plant City High School in front of three other deputies who had arrived at the scene. Chronister said during a news conference the deputy came on the department's main radio channel to say he'd harmed his family. He also told deputies he was going to kill himself near the high school and officers were sent to the scene. The deputy's final radio transmissions made reference to emotional and financial issues, the sheriff said. Names of the victims and the deputy weren't immediately released and the incident was still under investigation. The deputy had ties to the Sheriff's office dating back to 1991. He retired from the office and then returned to duty as a school resource officer. DOMESTIC VIOLENCE HELP: The National Domestic Violence Hotline at 800-799-7233 or 800-787-3224 (TTY) provides people in distress, or those around them, with 24-hour support.